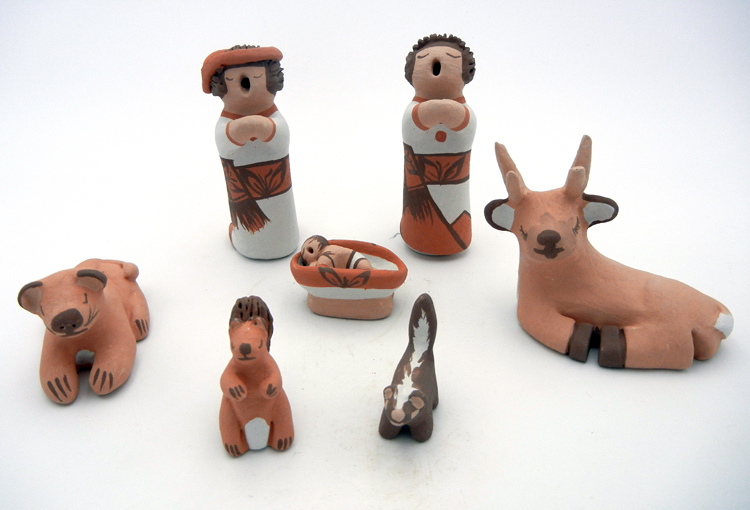 Consisting of seven separate pieces, all made of clay and hand painted, this traditional “Nacimiento,” or Nativity Scene by Isleta potter Mona Teller features Mary, Joseph, Baby Jesus, a squirrel, a skunk, a deer, and a mountain lion. Both Mary and Joseph are kneeling, their hands outstretched in prayer, and their mouths open, as though either speaking or singing. Baby Jesus lies in a clay manger, while both the deer and mountain lion lay down, the squirrel sits, and the skunk stands on all fours. 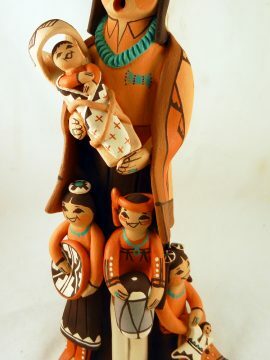 Mona painted the pieces in the style indicative of Isleta Pueblo, consisting of mainly buff, white, and muted red tones, as well as brown accents. 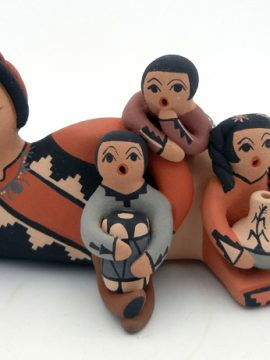 Joseph measures 3 3/4″ tall x 1 1/2″ wide. 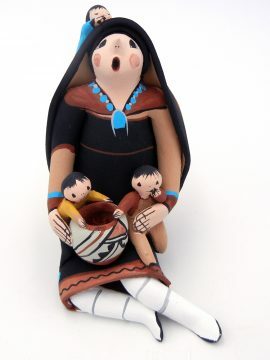 Mary measures 4″ tall x 1 1/2″ wide. 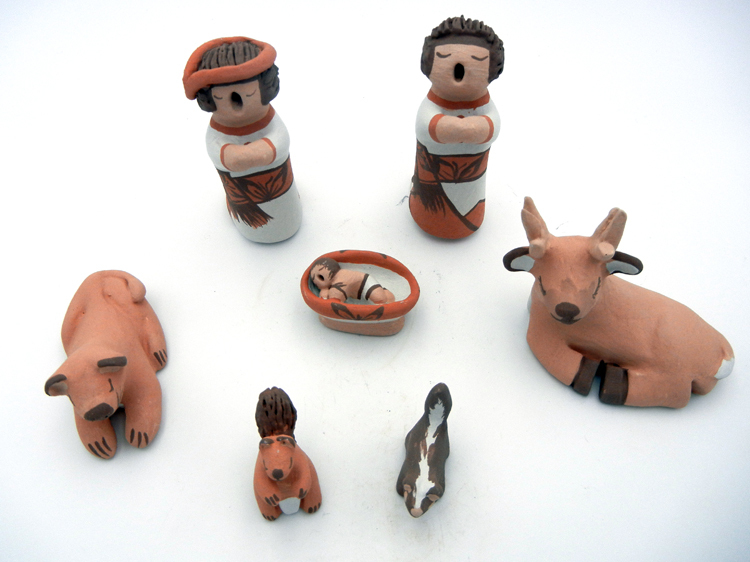 Jesus in manger measures 1″ tall x 2″ wide. 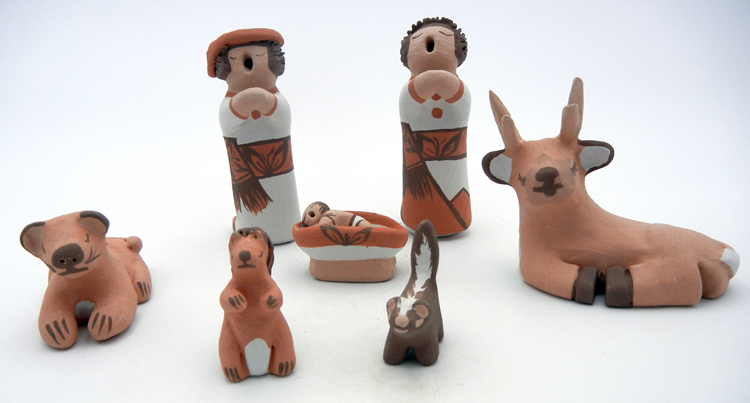 Deer measures 3″ tall x 3 3/4″ wide. Mountain Lion measures 1 5/8″ tall x 1 5/8″ wide. Squirrel measures 1 5/8″ tall x 1″ wide. Skunk measures 1 1/2″ tall x 7/8″ wide.